Are you looking for the perfect piece of jewelry for an upcoming special occasion? If so, then I highly recommend browsing the huge selection of fine jewelry and gifts available at Kranich’s Jewelers online or in store at a location nearest to you. Kranich’s Jewelers is proud to be a family owned and operated business since 1903 and offers the highest quality jewelry at attractive prices to fit many budgets. I love that I can have the experience of shopping with a family jeweler with the convenience of doing it online. I personally love to wear birthstone jewelry so I was excited to wear the Sterling Amethyst and Diamond Infinity Bracelet (SRP $149). This lovely piece is beautifully crafted from sterling silver and is highlighted by oval cut amethyst stones and genuine diamonds. The contrast between the sterling silver and Amethyst is very nice. I found it to be the perfect length to drape nicely on the wrist and the clasp is very securely so I do not have to worry that the bracelet will slip or fall off. It is lightweight and very comfortable to wear all day. It has an amazing sparkle to it and the piece actually looks like it should cost even more than the retail price. In fact, I had my husband guess how much this bracelet cost and he went significantly over in his best estimate. I appreciate that I can wear this pretty accessory with casual wear or dressier outfits depending on the occasion and either way it always looks great. I have even gotten lots of compliments from family and friends when wearing this piece. It has quickly become a favorite in my jewelry collection! There are lots of birthstone inspired Infinity bracelets to choose from at Kranich’s Jewelers including a few of my favorite pieces such as the Ruby & Diamond, Sapphire & Diamond (gorgeous) and Peridot & Diamond. If you are searching for a jewelry gift idea or want to update your summer jewelry collection then you are invited to head over to Kranich’s Jewelers to browse the entire selection of high quality jewelry. Which piece of jewelry is your favorite? Connect with Kranich’s Jewelers on Facebook and Twitter. I am a bracelet girl and that bracelet in the photo is gorgeous! Wow that bracelet is just lovely! That bracelet is very pretty, I will definitely be checking out their site! I love this bracelet ! I love the purple and the style. Thanks for sharing about this fabulous piece!! very nice pieces of jewellery, if I was rich there is quite a few on the site I would be buying!! That is really pretty! Sapphire is my birthstone so that is what I would pick! So pretty!! I can only wear gold though. Will check their site out! Love sapphires, Kranich’s has lovely jewelry! 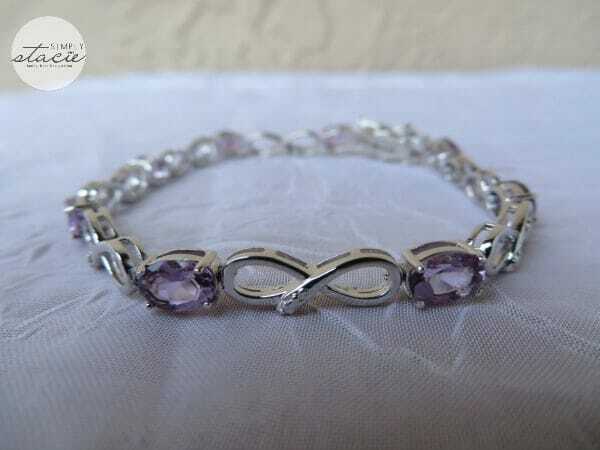 I love bracelets and that Sterling Amethyst and Diamond Infinity Bracelet is absolutely beautiful! Their items are gorgeous, I thought it wasn’t avaliable to Canada because their giveaways never are, good to know! What a beautiful bracelet. Thanks for the review of Kranich’s Jewelers they have beautiful jewelry. absolutely stunning!! I will have to check out their site, thank you. This is such a pretty bracelet! I love the infinity symbol. I have a big anniversary coming up and this looks like a nice gift idea! I love jewelry that incorporates the infinity sign, so pretty! That’s a lovely bracelet. Kranich’s really does have a great selection of jewelry.